As bombs fall over Libya, the Security Council debates what actions to take (or not take) with regards to the civil war in Cote d'Ivoire, and those of us with the luxury of distance debate whether what will happen there might constitute genocide in technical terms (or not), I've spent the last few days reading Rebecca Hamilton's excellent new book, Fighting for Darfur. Unlike the Cote d'Ivoire crisis, a large, international advocacy movement formed around the Darfur crisis, yet, at the end of the day, the movement was never able to achieve its primary goal of ensuring civilian protection in the region. Hamilton sets out to explain why. After the Rwandan genocide, most advocates, academics, and politicians believed that if a sustained, large, grassroots movement could be formed and maintained to pressure American officials to stop genocide and other crimes against humanity, then there wouldn't be any more Rwandas. The advocates were wrong. Hamilton, herself a prominent player in the Darfur advocacy movement, provides an analysis as to why that is simultaneously an insider's view and a more detached, analytical take on the question. While highlighting the Darfur movement's successes (including the development of sustained pressure on the US government, a Security Council resolution, and the appointment of a series of special envoys for Sudan), she finds that several dynamics interfered in reaching the ultimate goal of civilian protection. For one, most advocates had difficulty understanding that both the situation in Southern Sudan and the Comprehensive Peace Agreement and the Darfur crisis had to be addressed simultaneously, difficult as this was. Says Sam Bell, a leader in the movement, "I think one of the biggest missing pieces for the movement initially was context, understanding the context." This theme of a lack of contextual understanding pervades Hamilton's analysis. Advocates failed to understand that Sudan was not like Rwanda, that the situation in Sudan had evolved considerably by 2007-08, that their insistence on military action could - and did - have negative consequences for humanitarian operations serving Darfuris. But the biggest failure of understanding context came in understanding the role that the United States government could ultimately play in Darfur - or anywhere else in the world for that matter. Hamilton concludes that the advocates took years to finally understand that controlling the situation in Sudan is beyond the full reach of the United States government, the Chinese, or even the United Nations. Quite simply, we can't do everything. It's a sobering realization, and not one that Hamilton reaches lightly. Fighting for Darfur is an absolute must-read for anyone interested in advocacy, diplomacy, Sudan, and/or grassroots activism. That said, I do have a couple of criticisms. First, the book is a bit uncritical of specific organizations, even while acknowledging the difficulties and constraints that several groups faced (eg, GI-Net was run by college students with little experience in any professional setting for its first few years of existence and thus faced difficulties figuring out how to direct the money it had raised). I understand why Hamilton could not do so - she is, in many instances, writing about her friends and colleagues - but for those interested in learning how to do advocacy better, it would have been nice to have some analysis of the groups' relative degrees of effectiveness. Why was one organization able to attract large numbers of donors and email list subscribers while others struggled? Why were there so many organizations under the Darfur advocacy umbrella to begin with? Would a more coordinated effort have been able to better inform grassroots activists as the situation evolved? Second, while understanding that Hamilton needed to finish the book and get on with her life, I do wish that the publication had been delayed until after the results of this January's referendum. Hamilton spends a few paragraphs in the book's conclusion articulating the common-among-advocates view that the referendum might have evolved into violence, but of course that didn't happen. (To be sure, the question of what will happen in Abyei and other contested areas remains to be seen.) It would have been interesting to read reactions from those in the advocacy community who predicted - even assumed - that violence was inevitable and to hear them articulate what they thought made a difference. I suspect that the real answer to that question has a lot to do with Khartoum acting in its own self-interest and Scott Gration's insistence on engaging with Khartoum throughout the process, but those dynamics have not been particularly appreciated by Darfur advocates. All in all, I found Fighting for Darfur to be a fantastic read. I highly recommend it if you are in the advocacy community or want to learn more about those who are. Have you read Fighting for Darfur or were you involved in the Darfur advocacy movement? What do you think? As a special treat, I am pleased to be able to give away one copy of Fighting for Darfur to a lucky reader. All you have to do to win is leave a comment below before Saturday at 5pm EDT. I'll use a random integer generator to pick the winner, post it here, and the winner will have 48 hours to email me with your mailing address. If he/she doesn't do so in that time, I'll pick another winner. N.B. I was provided with a complimentary review copy of Fighting for Darfur by the author, but was not compensated for this review, nor was I provided with talking points. All opinions contained in this post are mine alone. UPDATE: The winner of the Fighting for Darfur giveaway, chosen via a random number generator, was comment #8, Akhila. Congratulations and thanks to everyone who entered. Akhila, please shoot me an email with your mailing address and I'll get the book to you asap. In the late 1990s, Rose Mapendo lost her family and home to the violence that engulfed the Democratic Republic of Congo (DRC). She managed to escape with nine of her ten children, and was eventually resettled in Arizona , where she became a prominent voice for reconciliation, as well as an advocate for other newly arrived immigrants. Over a decade later, she and the daughter who was left behind are reunited in the US , where they must learn to reconcile the past and embrace the future. PUSHING THE ELEPHANT is a joyful, hopeful, moving chronicle of the healing power of forgiveness.PUSHING THE ELEPHANT will be broadcast on Independent Lens on PBS, March 29. To see local listings, click here. To view the trailer for the film, click here. Is Cote d'Ivoire headed to genocide? No. At least, I don't think so. All of the above, will occur if everything stays the same. While I am happy to see the FRCI’s successes, I would like the world to understand that we have been here before. Gbagbo is boxed in militarily and politically. He has no way out. He is literally a prisoner in Abidjan with nowhere to retreat in Ivory Coast and dwindling options outside of the country. He is an historian and knows what happened to Charles Taylor, Samuel Doe, Dadis Camara and the like. It is only a matter of time till forces loyal to Mr. Ouattara take control of the whole country. What happens between now and then is up to all of us. I don’t know what the trigger will be for UN and French Licorne forces currently in Ivory Coast. The UN and France were in Rwanda. Both were sorry for their reluctance to protect civilians. They will have a do-over. I hope they make the right decisions this time for humanity sake. Now, I know a lot about Rwanda, but I am by no means a Cote d'Ivoire expert, so take my opinions here with that grain of salt in mind. I think Beheton makes some very interesting points here, but am not sure that this will lead down the path to genocide, even if things continue to go horribly wrong. Which they will. The international community's refusal to take this crisis seriously or do anything about it beyond inadequately funding the response to the humanitarian crisis is appalling. Like Rwanda in 1994, this crisis is the result of a previous series of crises and longstanding tensions that were allowed to fester for decades with little attention from the outside world. Exiles aren't invading Côte d'Ivoire & northerners control territory. Both Rwanda and Côte d'Ivoire have significant ethnic cleavages (whether constructed by colonizers or based on religion), but Côte d'Ivoire is different from Rwanda in that the base of power for the northerners (almost all of whom back Ouattara) is in the country rather than outside in a neighboring country. Furthermore, the two sides in this conflict are much more segregated by location than were Tutsis and Hutus Rwanda. Northerners control their territory and have done so for about a decade. I think this makes a real difference in how the fighting will play out. 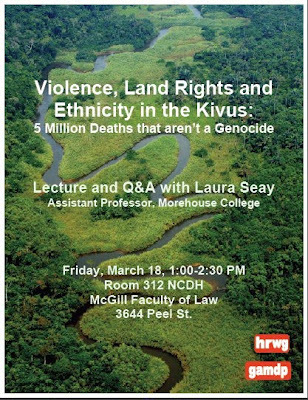 In Rwanda, massacring Tutsis was relatively easy for the Hutu extremists because Tutsis lived next door. In Côte d'Ivoire, while there's certainly a high concentration of northerners in Abidjan and other urban centers, most northerners are in the north. Those who are not can at least try to flee to the north, whereas Tutsis in Rwanda had few options for escape. Côte d'Ivoire is richer than Rwanda. The cocoa industry and Côte d'Ivoire's importance as a regional economic power means that a lot more people have an interest in seeing stability and a political solution to the problems there. France has pointedly taken a back seat to ECOWAS and the African Union through much of this crisis to avoid being seen as a neo-colonial power pulling the strings (which is exactly what Gbagbo wants France to do). But if things get really nasty, I think we'll see France become increasingly involved. Ivoirité is not Hutu Power. Ivoirité is a nasty ideology that developed in Côte d'Ivoire in the mid-1990's as a means of excluding northern Muslims from the country's political space by labeling them as "foreigners." While it's true that Côte d'Ivoire does have a large foreign population (workers come from all over West Africa to provide labor for the cocoa plantations), Ivoirité was not really aimed at them; it was aimed at Ivoirian Muslims and involved an explicit political goal, namely, excluding Ouattara from running for president in 2000. While there are lots of nasty manifestations of the ideology, as far as I know, we have not yet seen the use of Ivoirité to justify mass slaughter of Ivoirian Muslims in the same way that Hutu Power ideology was used to justify the killing of Tutsis. There's a qualitative difference; Hutu Power was always about eliminating Tutsis from the face of the planet, whereas Ivoirité has been about more subtle forms of discrimination and exclusion. That may be changing as we speak, but I imagine it will take some time. Cote d'Ivoire experts and interested observers, what do you think? Do I have this completely wrong? Is Côte d'Ivoire headed for genocide if action is not taken quickly? UPDATE: Beheton has posted a very thoughtful reply here. Emory University announces a joint three year post-doctoral teaching fellowship in African Studies and the undergraduate program in Global Health, Culture and Society (GHCS). We are looking for young, innovative scholars and dynamic teachers who work at the intersection of various disciplines such as anthropology, economics, history, women’s studies and political science on topics generally related to health and development. Applicants should have received the Ph.D. within the past three years. Fellows will be located in Emory’s Institute of African Studies (IAS) with affiliations to GHCS and relevant departments. Fellows will offer four courses yearly, one at the graduate level, and will be expected to participate in the activities of IAS, GHCS and various university global health programs. Ability to teach an undergraduate interdisciplinary “Introduction to Global Health” course is desirable. Please submit a CV, a letter detailing research and teaching interests, including proposed courses, and three letters of recommendation, to Clifton Crais, Director, Institute of African Studies, Institute of Liberal Arts, 537 Kilgo Circle, S415 Callaway, Emory University, Atlanta, GA 30322, or by email at ccrais@emory.edu. Review of applications will begin 1 April. Emory is an AA/EOE institution committed to diversity. Since the debate via blogs didn’t seem to be making much headway, Gabriel and I offered twice to hold a public discussion with MVP leaders, in October and December. Those invitations weren’t accepted. Philanthropy Action and AidWatch expressed dismay at the MVP’s lack of public engagement, and an online petition sprang up urging the MVP to engage us in a public discussion. The MVP’s home, Columbia University, is a world-class institution of critical and meritocratic thinking. I like Columbia, where more than one member of my family has served on the faculty. I wished that more people at the university had shown interest in fostering a public discussion. Tomorrow, at last, a public discussion will be held, not at Columbia but across the Atlantic at Oxford University’s Centre for the Study of African Economies (CSAE). CSAE’s annual conference is now underway. At Tuesday’s plenary session Gabriel will present our paper, with John McArthur of the MVP as a discussant. I’m very grateful to Oxford for arranging this event. That discussion is to be broadcast live on the Internet, Tuesday March 22nd, at 2:00pm Eastern US time (6:00pm UK time). It should be viewable at this link. I think this failure to deal with RPF crimes is one of the biggest problems that the gacaca process has brought up. It’s not talked about a lot in the literature on gacaca, but the population discusses RPF crimes explicitly during many gacaca trials. You have an RPF government, which is obviously very worried about people talking about RPF crimes in open spaces. But, especially on the periphery of Rwanda, gacaca has created a space where the population regularly talks about RPF crimes in a very public and comprehensive way. This is quite revolutionary in terms of Rwandan politics. The problem is that as people have talked about these crimes openly, there has been an expectation or a hope that gacaca would also prosecute RPF crimes – and that hasn’t happened. A great deal of frustration has been borne out by this process. It means that, in the long term, gacaca hasn’t delivered even-handed justice. It has been very comprehensive in terms of dealing with genocide crimes but has, in a prosecutorial sense, not dealt with the other side of the equation. This is a running sore for the Hutu majority, and the legacy of it will be that much of the Hutu population will look back on gacaca and see it as one-sided justice. In my opinion, there is no doubt that this will harm the long-term cause of reconciliation. Please register using your Twitter or blog handle if you have one so everyone knows who's playing. Brackets lock before the first game tips off on Thursday. You can't move another bracket from another group into this one after the first game tips off on Thursday. Nothing locks and nothing counts with regards to the play-in game on Tuesday. The winner will receive an awesome prize package of various SWEDOW items, including an Ace of Base cassette tape and a broken pedometer. If you have SWEDOW to contribute for the winning prize, shoot me an email and I'll let you know where to send it. If you're not American and/or not obsessed with the NCAA tournament, I'd still encourage you to enter. The person who wins these pools is almost always someone who has no clue whatsoever about the teams and picks based on the team uniform colors. Ugandans' votes cost more than they used to. A really helpful backgrounder on the dynamics of political collapse in Libya. An excellent piece on Gadhafi's role in African politics by Howard French. If you speak Portuguese, you can read what I think about the effects of Gadhafi's inevitable demise will have on other African states over at O Globo. Can data predict revolutions? If so, watch Mongolia, Nigeria, and India. Fox "News" covers union protests - in subtropical Wisconsin. I am thrilled to now be occasionally contributing over at TheAtlantic.com. Head over there now to check out my first piece, "Who Tried to Kill Congo's President?" Happy Texas Independence Day, y'all.